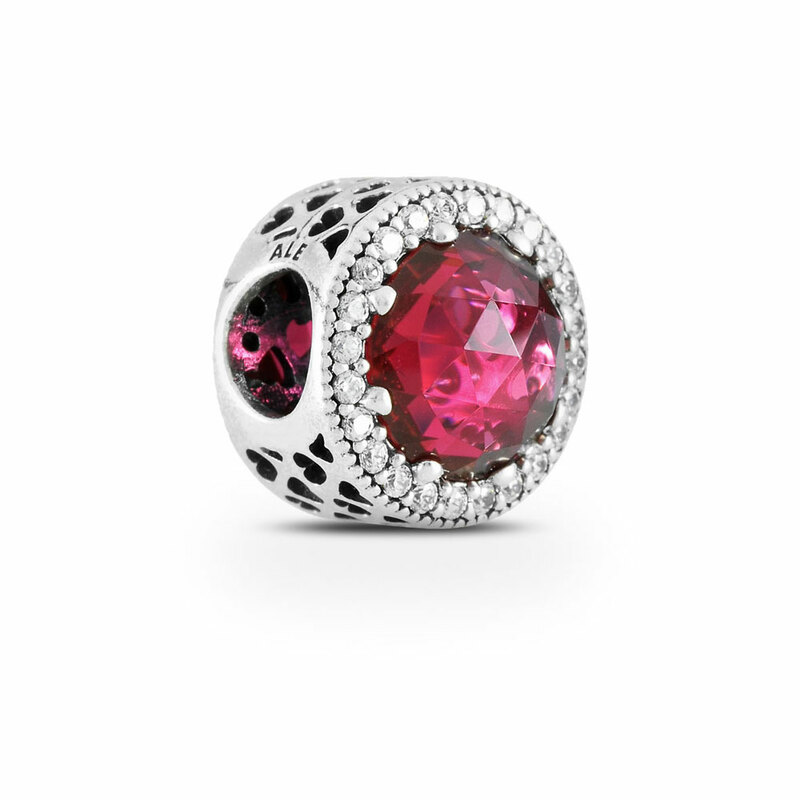 This elegant button-inspired charm is embellished with rose-cut stones in a vivid cerise hue, framed with twinkling cubic zirconia stones. The sculptural design looks stunning viewed from all angles; the heart details beneath the stones and the row of cut-out hearts on the side give the charm a romantic twist. Available online or in-store.This item is a single charm only. Bracelets sold seperately. Styling images may show this charm on a bracelet as styling inspiration. Cerise Radiant Hearts Openwork Charm is rated 4.6 out of 5 by 15. Rated 5 out of 5 by TeddyBear525 from Addicted! I love the radiant hearts charm collection! The cerise crystal is a new addition to my bracelet. It shines in every angle! Very dainty; love it! Pandora has got me hooked! Rated 5 out of 5 by Bobbie70 from Great Web Page I bought this for my family tree necklace that I got as a Christmas present from my daughters. The stone is my first daughters birthstone. I went to a store to get it first and they tried to sell me the wrong charm. Glad this website was here, so I could get the correct charm. Rated 1 out of 5 by AngryCustomer69 from Liars Bought this the Tuesday before mother’s day on the site. 3-day shopping guaranteed it’ll be there by Sunday, which was mother’s day. It arrived on Monday. Never ordering from you guys again. The charm itself is very nice though. Rated 5 out of 5 by 01markh from Stunning The deep red charm with the CZ crystals and silver setting is stunning! Can't wait to see the look on her face when she opens it! Rated 5 out of 5 by Boutiquegirl from Great charm! I bought this and like it so much that I purchased another one!